There are various versions in the south of Italy, and both the Neapolitans and Sicilians proudly claim it’s theirs. The Sicilian variety is good, and in fact anything that contains fried aubergines is good by definition, the way I see it. On the island, however, parmigiana often contains ham and sliced boiled eggs, which strike me as an unnecessary, out-of-place distraction from the aubergines. It’s also served at room temperature. In Naples, meanwhile, it’s hot and passionate, and stripped down to the essentials: aubergines, cheese and tomatoes. As I said, love on a plate. And that means heat, not cold; you should be prepared to risk getting your tongue burnt. But there’s a payoff. Comparing the pleasure you get from caramelized aubergines melting in your mouth with oozing mozzarella and tomato sauce, to the experience of cold fried aubergines, boiled eggs and resolidifed melted cheese is like comparing a night of passion with the woman you love to a peck on the cheek from an ageing aunt. So, need I specify? You’re getting the Neapolitan version. 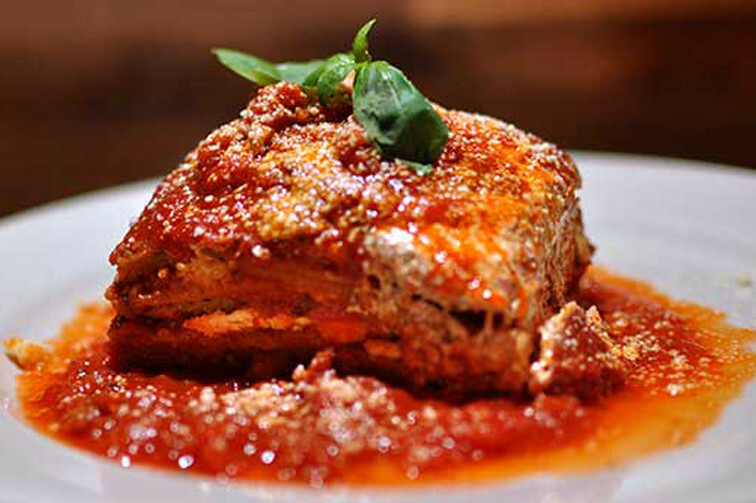 Parmigiana and I go back a long way, to Naples in the early nineties, to be precise. I had just arrived in this sprawling, buzzing city, without a word of Italian and without any idea about real Italian food. On one of my first nights, some of my new friends took me to what seemed like a hole in the wall in the Vomero district of the city, leading me down some steps to a bustling but intimate den of a trattoria just below street level. Like many places back then in Naples, the atmosphere had something of an old-style smoky bistrot. It was run by a wizened, smiling Neapolitan nonna, whose name escapes me, and who is probably frying aubergines for the angels by now. She smiled a lot at me, I remember, after doing her very best to communicate with me in Neapolitan dialect, and quickly coming to the conclusion that smiling was perhaps a better option. Either way, I felt immediately at home, and ended up returning often, each time managing to exchange a few more words along with the smiles. The menu was of course incomprehensible to me, but when I worked out that one of the dishes contained aubergines, I had to try it. This was back in the days when aubergines in England were still bordering on the exotic, so I felt like some kind of food pioneer as I ordered this unknown delicacy, which of course the locals had probably been eating for centuries. When the plate arrived, still bubbling from the oven, seeping orange, tomato-infused oil, the aroma of fried aubergine, golden parmesan and basil was inebriating. It was flamethrower hot and untouchable, but nevertheless irresistible. So I started round the edges and gradually worked my way to its molten heart, searing mouthful after searing mouthful. It was probably the best thing I had ever tasted in my life, and it was love at first bite. The aubergines and mozzarella melted into each other, doused in boiling tomato and basil sauce. And this too was a revelation. I realized I had never really tasted tomatoes before, had never realised how rich and sweet they could be. Fry the sliced aubergines in batches in olive oil until golden, laying them on kitchen paper as you take them out of the pan to soak up the excess oil. Choose an oven/soufflé dish of a size that will allow you to have at least three layers of aubergines. Spoon a little tomato sauce over the base. Follow with a layer of aubergines, then tomato sauce, seasoning, a few torn up basil leaves, torn up pieces of mozzarella, and grated parmesan. Repeat the aubergine-sauce-cheese sequence until the ingredients are used up, remembering to make sure you have at least three layers. Finish with an abundant layer of grated parmesan. Drizzle some olive oil over the top. Bake at 180°C for 35-40 minutes, until golden on top. Take out of the oven and leave to rest for 20 minutes before eating. This resting period is important, and helps the ingredients melt into each other. It also ensures you avoid third-degree burns in your mouth. Love on a plate is one thing. Sado-masochism on a plate something else. By the way, yes, this is a vegetable dish, but that doesn’t mean it’s for dieters. Calorie-wise it’s probably equivalent to a deep pan pizza with extra mozzarella and salami. This entry was posted in Recipes, Vegetables & side dishes and tagged aubergines, mozzarella, vegetable by hungryenglishman. Bookmark the permalink. Luckily up here there’s none of that aubergine stuff. Just loads of pizza and Two Hoots beer!